Today I'm playing along with 31 Days of Halloween and Stampendous will have Halloween projects for you everyday, you'll want to stop by their blog and take a look, link is at the bottom of the page. I found this glass at Michael's and thought it would look really cute with a bag of candy in it and a tag tied around the bag. 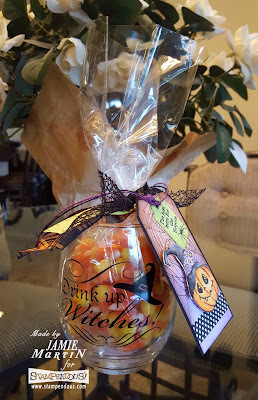 I used several Stampendous stamp sets to make the tag Halloween Hats and Dies for the pumpkin, Spider Fear for the spiderweb and spider plus Spooky Wishes for the sentiment. Really cute tag for your treat holder! I love the Jack o' lantern! 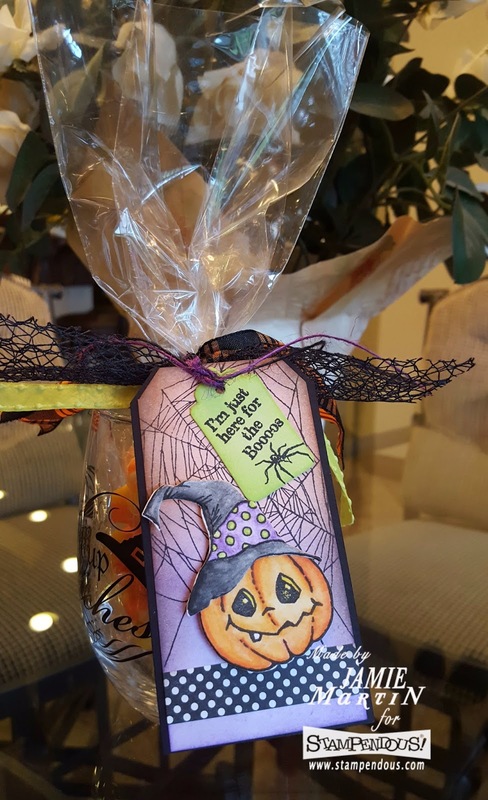 Gorgeous tag for your candy container! a future treat for somebody. I love your tag! Great coloring and wonderful idea for a candy dish. Got to have it all. This is my favorite time of year and your tag is delightful. Into the Halloween Hall of Fame bookmarks so I can do this next year if it's okay with you. Love the container AND the tag! Great job!